Elizabeth Maimo, a 52-year-old farmer barely ekes out a living from a tiny parcel of land she rents in Santa village in the North West Region of Cameroon. The mother of five finds it hard to put food on the table for herself and her children, talk less of sending them to school. But some ten years ago, she and her husband were considered well-off. Farming on over 10 hectares of land, Maimo and her husband could comfortably feed their family and sell the surplus to raise family income. In a country where 40 percent of the population lives below the poverty line, her family was counted among the wealthy. But things changed when her husband died three years ago. The land was taken away from her and her children. “Just after my husband was buried, my in-laws confiscated the 10 hectares of land on which we have been cultivating for the past twenty years” she lamented. “Today I am managing on a rented, smaller piece of land and this has reduced my yields and income by more than 50 percent,” Maimo said. Traditional practices in the area just like in many African cultures give the right to inherit land exclusively to men. “Things have become so difficult that I have had to take some of my kids out of school,” she said. Another female tomatoes farmer in Bambili in the Northwest Region of Cameroon, Julie Ngeh, says she surrendered to the dictates of the custom of her area, losing her three hectares of farm on a family land in 2013 to her younger brother, a herder, who wanted more space to breed cows. Maimo and Ngeh are just two of millions of female African farmers who are disadvantaged by cultural practices and laws that deny them equal access to land. Women farmers in most African countries according to a 2013 report by Rights and Resource Initiative, RRI are the most disenfranchised in spite their numerical strength. Figures from the National Institute of Statistics for 2012 indicate that women constitute 52 percent of Cameroon’s 20 million people. And although women produce 80 percent of Cameroon’s food needs according to the Ministry of Agriculture and Rural Development, they own just two percent of the land, according to 2011 statistics from the Cameroon Gender Equality Network. “If we are talking about a just and equitable society, then women should be able to control at least 35 percent of the land,” Judith Awondo, the coordinator of the network, a non-governmental organization that works for women’s empowerment, said. Although the 1974 Land Tenure Ordinance in Cameroon guarantees equal access to land for all citizens, customary laws and practices that discriminate against women’s land rights prevail over statutory laws. This has taken its toll on the economic wellbeing of women with many locked out of farming opportunities experts say. “The inability of women to freely access and control productive resources places them in a weaker position in terms of agricultural productivity and economic growth, food security, family income and equal participation in governance,” says Ajeck Nicolas coordinator of the Cameroon Movement for the Right to Food, a local NGO. According to a 2011 household survey, 52 percent of people living in Cameroon’s poor households are women. But African women’s rights activists are intensifying their efforts to push governments to speed up land reform processes and establish clear legislation securing women’s rights to own, access and control land and other natural resources. According to Gregory Muluh, coordinator of Grassfield Project, a government initiative assisting women farmers in Cameroon’s northwest, the country needs a specific law that protects land tenure for women, not a generalized ordinance that is hardly applied. “Even if people know that refusing women the right to own land is wrong, there is nowhere to complain, and women end up swallowing a bitter pill,” Muluh said. “Instituting a legal provision to safeguard the rights of women to land ownership is imperative to give them a solid economic footing and enable them contribute fully to development,” he emphasized. The African Women's Network for Community Management of Forests (REFACOF), an international NGO, believes only reforms that include legal safeguards giving women equal say in decisions made by customary and state authorities on managing land and forest resources will boost gender equality on the continent. “We know that wherever land rights are being ignored, women are indisputably the most affected. Banding together and raising awareness of these issues is the first step toward ensuring all women’s rights are recognised,” Cécile Ndjebet, president of REFACOF, told PAMACC News. Ongoing land reforms in African nations such as Cameroon, Chad, Cote d’Ivoire, Democratic Republic of Congo, Liberia and Senegal have yet to incorporate any special protection for women, according to REFACOF. “Globally, people are starting to understand the contributions women make to development. The importance of securing land rights for women in achieving development can therefore not be over-emphasised,” said Ndjebet, from Cameroon. She called for the post-2015 development goals, which are now under discussion, to include a land rights indicator for women. “(This) would be indicative of how women’s advocacy for land rights has received critical attention,” she added. Her group and others are pushing hard for improvements to customary land rights for African women, particularly across West and Central Africa, according to Ndjebet. In Cameroon, for example, the Bagyeli community of Nyamabande in the East Region, an indigenous group of hunter-gatherers, has won customary rights over a large swathe of disputed land between the Campo-Ma’an National Park and the HEVECAM rubber plantation, thanks to advocacy by REFACOF, Ndjebet said. At a conference in Yaounde, ahead of International Women’s Day on March 8, 2014,Cameroon’s minister of women’s affairs called for a collective effort by women across the continent to fight for progressive policies. “Cameroon’s rural women, like those of other countries in Africa, are grappling with numerous challenges, including poverty, preventable diseases and the impacts of climate shifts on farming and other aspects of their daily lives. We need policy reforms that protect the rights of this vulnerable group in society - especially the right to own land and other resources,” said Catherine Abena Ondoa. Her ministry is pushing for the passage of a new family code into law, which will enshrine the right for women to own land and other natural resources, among other things, she added. More than 50 participants from 16 African countries meeting in Monrovia in Liberia in March 2014 to discuss gender, climate and tenure issues also called for a boost in status for disenfranchised women across the continent, enabling them to own land. REFACOF argues that such a move by Liberia would speed up reforms on women’s rights and bring positive shifts in land ownership across Africa. “Time is running out. The reform process (in Liberia) is already underway. While the land reform ‘aims to give equal protection to the land rights of men and women’, there is still no clear legislation securing women’s rights to own, access, or control land and resources. But we can change that!” said the petition, issued on Feb. 27, which urges Johnson Sirleaf to ensure those rights are protected and safeguarded by law. If Liberian women are granted the full right to own their land, it could propel a transition to equality across Central and West Africa, where other countries are just beginning their land reform processes, said the petition, which has almost 500 signatures. Liberia’s Poverty Reduction Strategy notes that women are major players in the agricultural sector, making up the majority of small-holder producers and the agricultural labour force. Women produce some 60 percent of agricultural goods and carry out 80 percent of trading activities in rural areas, but they have less access to productive inputs than men, including land, skills training, basic tools and technology, the strategy says. The situation is similar in many developing countries. A September 2013 report from the Thomson Reuters Foundation and the World Bank said a woman’s ability to own, inherit and control land and property is vital to her ability to access resources and participate in the economy. “Yet many women do not have legal ownership rights to the land on which they live and work. This can increase women’s dependence on husbands and male, land-owning relatives and limit their access to credit and productive inputs,” the report said. 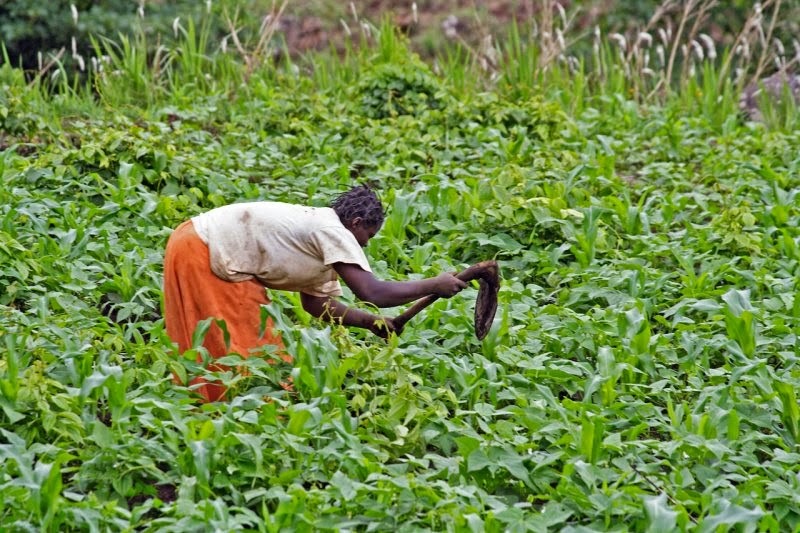 In Western and Central Africa, generally less than 10 percent of landholders are women, according to data from the U.N. Food and Agriculture Organisation. According to Ndjebet of REFACOF there is need to change the often repeated notion in most African cultures that women should get only the smaller piece of pie. “For real political and social change to take place, there are three pillars that need to be addressed. We need legislation that protects equal rights for women, mechanisms that provide for political and social equity, and a change in social and cultural perceptions of women,” Ndjebet said.